Part 1 Sustainability through the supply chain: Achieving sustainable textiles: A designer’s perspective; Sustainable cotton production and processing; Sustainable wool production and processing; Sustainable synthetic fibres: The case of poly(hydroxyalkanoates) (PHA) and other fibres; Enzyme biotechnology for sustainable textiles; Key sustainability issues in textile dyeing; Environmentally-friendly plasma technologies for textiles; Understanding and improving textile recycling: A systems perspective. Part 2 Applications and case studies: Consumer perceptions of recycled textile fibres; Eco-labelling for textiles and apparel; Organic cotton: Production practices and post harvest considerations; The role of nanotechnology in sustainable textiles; The use of recovered plastic bags in nonwoven fabrics; Environmentally-friendly flame-retardant textiles; Systems change for sustainability in textiles. Environmental issues are playing an increasingly important role in the textile industry, both from the point of view of government regulation and consumer expectations. Sustainable textiles reviews ways of achieving more sustainable materials and technologies as well as improving recycling in the industry. The first part of the book discusses ways of improving sustainability at various points in the supply chain. Chapters discuss how sustainability can be integrated into textile design, ensuring more sustainable production of both natural and synthetic fibres, improving sustainability in processes such as dyeing as well as more environmentally-friendly technologies including enzyme and plasma technologies. The second part of the book reviews consumer perceptions of recycled textiles, eco-labelling, organic textiles and the use of recycled materials in textile products. 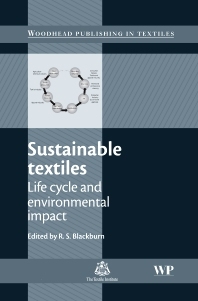 With a distinguished editor and an impressive range of international contributors, Sustainable textiles is an important reference for the textile industry and those researching this important topic.